Coupon Codes Place: CanvasOnDemand.com Enter to Win a $25.00 Gift Certificate! CanvasOnDemand.com Enter to Win a $25.00 Gift Certificate! Not too long ago, I was asked to review CanvasOnDemand. As part of the review process, I was given a free product. Let me tell you, I love it. I had a picture of my daughter put on a canvas with the wraparound gallery finish. I've included a picture, so you can see why I love it! CanvasOnDemand.com was nice enough to send me gift certificates to distribute. The gift certificate can be applied towards your purchase on CanvasOnDemand.com . The certificate expires in April 2008. I decided to give a few away on my sites. This canvas art makes a great, unique gift idea for grandparents, newlywed couples or even adult children. Who doesn't love to see their favorite pictures on display? All you have to do is subscribe to the Coupon Codes Place. The winner will be chosen on Thursday, November 29, 2007 at 5pm. I will need the winner's address to mail the gift certificate. Oh and here's a coupon code, in case you want to shop today! 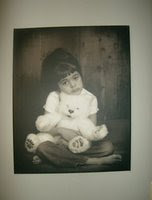 Save 10% today on a gift to cherish at Canvasondemand.com. Use code CODSLS.